This is a ZigBee smart scene wall switch designed to operate on scenes (i.e. ‘Away Mode’, ‘Cinema Mode’) and control multiple devices in-one- click. It can connect to the ordinary incandescent, halogen and LED lights. 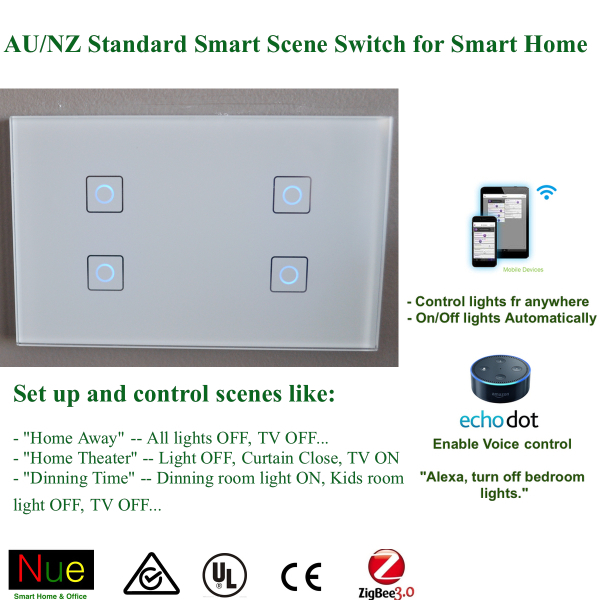 With Nue ZigBee Bridge, the users can control these switches via App Nue Home on smartphone and tablet anywhere you have internet connection. Also, you can manually click the switches buttons to control the switches and voice control through Amazon Echo.